Let's look at three of the main causes of paramotoring accidents and learn how we can avoid them. We'll look at power line accidents, a lack of landing options, and mid-air collisions. Paramotoring is considered one of the safest forms of aviation, but accidents are still happening, a lot! Since I started flying I've seen and read about dozens of paramotoring accidents; and I can say with absolute certainty that they were all caused by pilot error. In this post we're going to find out the most common causes of paramotor accidents, and how to avoid them. I've already covered propeller accidents in a separate article which I encourage you to read straight after this one. We discovered that prop injuries are completely preventable, but you need to understand how they're happening to stay safe. Go > HERE < to check out the full post, but be warned there are some graphic images. So without further ado let's look at a hazard that we're all warned about during training. This is a danger to almost every pilot on the planet, not just paramotorists; and it's brought down many an aircraft. Power lines have been taking down planes, helicopters, and hot air balloons for decades. There's nothing else that sends a rush of terror through a pilot’s body like the sudden sight of a set of power lines just a few feet from the aircraft. 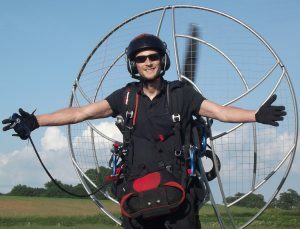 As our sport gains popularity it's become one of the top causes of paramotor accidents. Unlike a plane that has a small chance of cutting through the lines with it's propeller, paramotors have no chance. Pilots will usually end up hanging from the lines, suspended by their wing. Although they're common these accidents are rarely fatal, probably because pilots don't usually hit the ground; and when they do it's not far for them to fall. But they do frequently cause serious injuries, including burns. Low flying - Pilots are notorious for thinking they’ll see the power lines in time to avoid them. But the lines aren't always visible, you've got to start thinking about lines as an invisible hazard. If you're going to be doing any low flying it's important to conduct a reconnaissance of any unfamiliar areas. We all know that we struggle to see the smaller power/telephone lines from altitude so look out for poles as you fly over the area. Power lines commonly follow roads, tracks, or hedge lines, but don't be fooled by this. If you start thinking you know where power lines are placed you'll be in for a shock, quite literally. Expect to see them anywhere you're able to fly over. Hidden poles - A good reconnaissance also means checking for hidden poles. Sometimes power lines will stretch across huge fields with no support poles in between. These poles can be obscured by trees at both ends, this could get you into big trouble. The field will look clear until you get very close so be sure to have a few passes to check. Complacency - After many years / hours of flying a pilot can develop a feeling of complacency which lowers attentiveness. You need to be fully alert at every moment you're in the air, especially when flying low. Don't look away for a second, and keep your phone / camera in your pocket to avoid distraction. 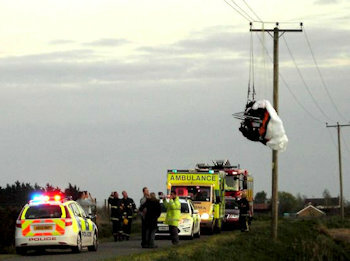 Launch / landing fields - If your field is close to power lines then you need to be extra careful. I read about a pilot that flew into power lines at his regular spot which was actually a very large field. He'd been flying from there for many years and knew where all of the power lines were. Unfortunately the pilot didn't make it, so we don't know the exact reason he hit them. Make sure there's plenty of space to clear the lines on takeoff and have a plan in case of engine failures right after launch. If there's ever any doubt as to whether you'll clear the lines, don't attempt to launch. When you come in to land keep your engine running until you're past the lines and clear of any danger. Showing off - We're all guilty of pulling a few wing overs when we see people waving down below. We might even give them a low pass and wave back. But you don't need to be as low as the power lines, people can easily see you waving from 200 ft.
A pilot made this mistake a couple of years back when he saw something interesting down below and decided to take a look. He flew towards a marquee to give some people a wave, and only saw the power lines at the last minute because the poles were hidden. He pulled hard right and powered up but his wing clipped the lines. He hit the ground hard but luckily lived to tell the tale. John Freeman's theory - Former U.S. Civil Aviation Authority Examiner of Airmen, the late John Freeman believed the 70 degree human field of vision can be a problem. That, combined with even a pilot’s good visual acuity means that there's inherent visual traps in detecting something as fine as a power line. A pilot approaching wires between two visible poles would normally be too far away to see the wires, or too close to see both the poles at once. Clues within the field of vision would be outside the range of vision, and vice versa. "I'm OK and there were lots of factors. Long story short, land away site that I've never been to before, low light, paralax, engine vibration and a busy area which meant I couldn't fully observe the field while carrying out my over fly check. I was conducting a dry run and only spotted them 10 meters before. It wasn't a pleasant experience and I'm one lucky chap. I'm an experienced pilot and regularly fly". Paramotoring accidents involving power lines can be completely avoided by following all of the above. Now let's look at something I see so many pilots putting themselves at risk of every time they fly. Paramotoring accidents: No landing options! It's easy to get carried away when you're flying over trees and water. Maybe you need to get somewhere quickly, or maybe you're looking for that epic photo or video. Unfortunately the unreliable two stroke engines that most paramotors use makes this risky business. If your engine suddenly quits with no warning you're coming down, and there's nothing you can do about it. Water has been a big killer in our sport, when you come down into deep water the weight of the paramotor will drag you under in seconds, and it's unlikely you'll un-clip in time to get free. Coming down into trees has been another cause of serious injury amongst paramotorists. I recently saw a photo of a pilot who crashed his paramotor trike into a forest in Belarus. The pilot had been impaled by a tree branch of around 4 inches in diameter, luckily he survived but the pain must have been excruciating. If you need to fly over trees, water, or anywhere else that leaves no landing options you need to fly high. Fly high enough that you'll be able to glide to safety if the engine cuts out. If there's no landing options within gliding distance then don't risk it. Flying over water with no landing options can be made a little safer by using a flotation device. These can be fitted to the harness to give buoyancy in the event of an accident. But even with a flotation device you'll be taking a big risk as you can end up face down in the water. The wing can also come down on top of you, when the wing gets wet or takes in water you'll struggle to swim. The wing's lines can also cause problems if they wrap around your arms or legs. The only safe option here is to gain altitude while keeping a safe glide distance. Even pilots that fly more reliable aircraft are given this advice, so always keep a landing option available and never trust your engine. This is another type of paramotoring accident that can be completely avoided if you follow everything mentioned above. Check out my full post on flying safely over water HERE. Next up is something that all paramotor pilots need to be aware of at every single second of a flight. Mid-air collisions are a threat to all pilots and there are plenty of near misses that come to mind. Fast jets are known to buzz around paragliding hills causing a hazard to paragliders, hang gliders, and paramotorists. I remember a story of two paragliders getting caught up in the wash of a low flying jet which led to a crash and a broken leg. This also led to a lawsuit as the paragliders had issued a NOTAM to let other pilots know they were there. A mid-air collision can happen at any altitude, but pilots that fly at high altitudes are at higher risk. You can read about a near miss with an Airbus A400M that happened a couple of years back > HERE. I also need share an experience I had in 2016 that involved myself and a microlight. The visibility was great and I was flying at about 1000 FT following the edge of the Severn river. I noticed a microlight coming straight at me so I turned right to avoid it. Fifteen minutes later I was heading back in the same direction and there it was again. This time we both turned to avoid a collision. I received a phone call from a good friend the following day asking if it was me flying a paramotor along the Severn river. It turns out that he was the one flying the microlight and he hadn't even seen me during the first pass, neither had his passenger!! He also told me he hadn't seen me until he was very close on the second pass. You're never going to be completely safe from a mid-air paramotoring accident; especially if an aircraft approaches you from behind and the pilot doesn't see you. Pilots should be 100% alert and aware of their surroundings at all times, but we know this isn't always the case. I spoke to a pilot that flies cargo planes and he told me that they rarely look out of their windows! Conversations with military and commercial airline pilots also confirms that they don't even know we are there. We can sometimes show up on radar but we look no different to a flock of seagulls. This is why we need to do everything in our power to make ourselves more visible to other pilots. We can start by fitting a bright strobe to our paramotors. Specially designed strobes are super bright, light, and use small batteries that easily attach to our frames. You can read my full report on why we're so hard to see, and also find out all about the two best strobes on the market HERE. You should make it a habit to check NOTAM information before every flight at websites like this one. You can also use apps like runwayHD to find up to date NOTAM data for your area. Check out my list of the top paramotoring apps HERE where you can find runwayHD. You could even issue your own NOTAM if you know exactly where you'll be flying. Many paramotor pilots will do this before every flight if they're flying in an area of high aircraft activity. This way every other pilot flying around you will know to be on the look out for a paramotor. It's also recommended that you put up a NOTAM if you're flying during the weekday to warn the air force of your presence. And it's a necessity for anybody flying paramotors over 10,000 FT. Your wing colour can also make a difference to your visibility. In my experience it's much harder to see any aircraft when you're looking down from above them. With that in mind, flying a dark green wing when you do most of your flying around rolling hills and trees is probably a bad idea. 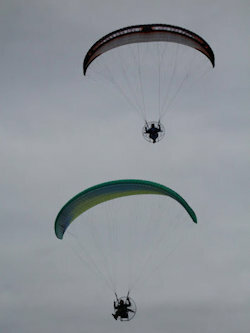 Take this into consideration when choosing your wing, the last thing you want is a camouflaged paramotor. I need to mention a recent mid-air paramotor collision where one pilot died, and the other pilot was very seriously injured. The two collided whilst waiting for their friends to launch below them. A friend of the pilots said it was simply a case of them not paying attention, and looking down for there friend. So again, be 100% aware of everything happening around you, especially when flying with other paramotorists. Another student very nearly crashed into the side of me because I flew up and positioned myself next to him without him realising. He suddenly turned right without looking first, I pulled the right brake has hard as I could and hit the power. We missed each other by about five feet and the first thing he knew about it was when he felt my prop wash. It's advisable to always fly at different altitudes so that a sudden turn won't lead to a collision. Paramotoring accidents that happen because of close proximity flying can all be avoided. 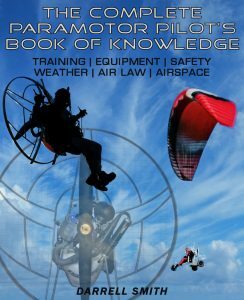 I've covered a lot of safety topics on this website and explored many other causes of paramotoring accidents. After checking out the post on propeller accidents that I linked at the top, there are a few other articles to read. A pilots decision to fly during strong wind, thermals, or rotor can be his last. I covered all of these in > this post < so be sure to check it out. I also cover lots of pre flight checks that should never be neglected. And also check out my > wing collapse post < where we find the causes and solutions of a collapse. We also find out why a wing collapse can actually be a good thing! Remember, 99% of paramotoring accidents can be avoided! Unfortunately that last 1% will always be there because of the risk other aircraft pose. Follow the advice you've just read, check out the other linked posts, keep your equipment well serviced, and you'll be very safe up there. This site is here to help other pilots to stay safe so share any other safety tips below. If they're relevant I'll add them to this post! Let's help make paramotoring accidents a thing of the past. If you feel nervous about paramotoring, or if you have a fear of flying, learn how to overcome your fears > HERE. If this post hasn't put you off, which it certainly shouldn't, you can find out what paramotoring gear you'll need to get before you can fly > HERE. Wow, great site and information you’ve got here, so happy to find it and learn more about this sport. Thanks for all the good reading and info for all existing and interested pilots. Nice job! Thanks for the kind words Mike, I’m really glad you’re enjoying the site!